OAK RIDGE, Tenn., Oct. 3, 2018—The Department of Energy’s Oak Ridge National Laboratory is the recipient of six awards from DOE’s Office of Science aimed at accelerating quantum information science (QIS), a burgeoning field of research increasingly seen as vital to scientific innovation and national security. The awards, which were made in conjunction with the White House Summit on Advancing American Leadership in QIS, will leverage and strengthen ORNL’s established programs in quantum information processing and quantum computing. The application of quantum mechanics to computing and the processing of information has enormous potential for innovation across the scientific spectrum. Quantum technologies use units known as qubits to greatly increase the threshold at which information can be transmitted and processed. Whereas traditional “bits” have a value of either 0 or 1, qubits are encoded with values of both 0 and 1, or any combination thereof, at the same time, allowing for a vast number of possibilities for storing data. While in its infancy, the technology is being harnessed to develop computers that, when mature, will be exponentially more powerful than today’s leading systems. 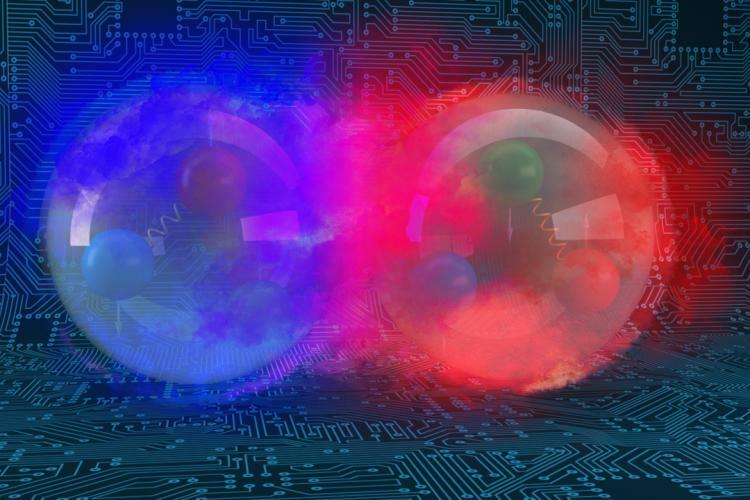 Beyond computing, however, quantum information science shows great promise to advance a vast array of research domains, from encryption to artificial intelligence to cosmology. The ORNL awards represent three Office of Science programs. “Software Stack and Algorithms for Automating Quantum-Classical Computing,” a new project supported by the Office of Advanced Scientific Computing Research, will develop methods for programming quantum computers. Led by ORNL’s Pavel Lougovski, the team of researchers from ORNL, Johns Hopkins University Applied Physics Lab, University of Southern California, University of Maryland, Georgetown University, and Microsoft, will tackle translating scientific applications into functional quantum programs that return accurate results when executed on real-world faulty quantum hardware. The team will develop an open-source algorithm and software stack that will automate the process of designing, executing, and analyzing the results of quantum algorithms, thus enabling new discovery across many scientific domains with an emphasis on applications in quantum field theory, nuclear physics, condensed matter, and quantum machine learning. ORNL’s Christopher M. Rouleau will lead the “Thin Film Platform for Rapid Prototyping Novel Materials with Entangled States for Quantum Information Science” project, funded by Basic Energy Sciences. The project aims to establish an agile AI-guided synthesis platform coupling reactive pulsed laser deposition with quick decision-making diagnostics to enable the rapid exploration of a wide spectrum of candidate thin-film materials for QIS; understand the dynamics of photonic states by combining a novel cathodoluminescence scanning electron microscopy platform with ultrafast laser spectroscopy; and enable understanding of entangled spin states for topological quantum computing by developing a novel scanning tunneling microscopy platform. ORNL’s Stephen Jesse will lead the “Understanding and Controlling Entangled and Correlated Quantum States in Confined Solid-State Systems Created via Atomic Scale Manipulation,” a new project supported by Basic Energy Sciences that includes collaborators from Harvard and MIT. The goal of the project is to use advanced electron microscopes to engineer novel materials on an atom-by-atom basis for use in QIS. 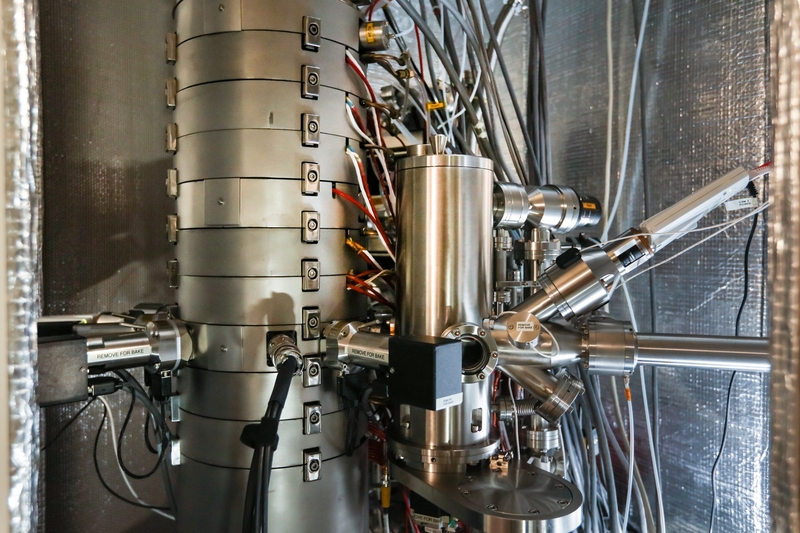 These microscopes, along with other powerful instrumentation, will also be used to assess emerging quantum properties in-situ to aid the assembly process. Collaborators from Harvard will provide theoretical and computational effort to design quantum properties on demand using ORNL’s high-performance computing resources. ORNL is also partnering with Pacific Northwest National Laboratory, Berkeley Laboratory, and the University of Michigan on a project funded by the Office of Basic Energy Sciences titled “Embedding Quantum Computing into Many-Body Frameworks for Strongly-Correlated Molecular and Materials Systems.” The research team will develop methods for solving problems in computational chemistry for highly correlated electronic states. ORNL’s contribution, led by Travis Humble, will support this collaboration by translating applications of computational chemistry into the language needed for running on quantum computers and testing these ideas on experimental hardware. “Quantum-Enhanced Detection of Dark Matter and Neutrinos,” in collaboration with the University of Wisconsin, Tufts, and San Diego State University. This project will use quantum simulation to calculate detector responses to dark matter particles and neutrinos. A new simulation technique under development will require extensive work in error mitigation strategies to correctly evaluate scattering cross sections and other physical quantities. ORNL’s effort, led by Raphael Pooser, will help develop these simulation techniques and error mitigation strategies for the new quantum simulator device, thus ensuring successful detector calculations. “Particle Track Pattern Recognition via Content Addressable Memory and Adiabatic Quantum Optimization: OLYMPUS Experiment Revisited,” a collaboration with John Hopkins Applied Physics Laboratory aimed at identifying rare events found in the data generated by experiments at particle colliders. ORNL principal investigator Travis Humble will apply new ideas for data analysis using experimental quantum computers that target faster response times and greater memory capacity for tracking signatures of high-energy particles. “HEP ML and Optimization Go Quantum,” in collaboration with Fermi National Accelerator Laboratory and Lockheed Martin Corporation, which will investigate how quantum machine learning methods may be applied to solving key challenges in optimization and data analysis. Advances in training machine learning networks using quantum computer promise greater accuracy and faster response times for data analysis. ORNL principal investigators Travis Humble and Alex McCaskey will help to develop these new methods for quantum machine learning for existing quantum computers by using the XACC programming tools, which offer a flexible framework by which to integrate quantum computing into scientific software.